There is a new generation of musicians with a growing interest in performing in and attending concerts by orchestral ensembles. Kids have always wanted to learn to play the melodies from Hollywood blockbuster movies and hit television shows, but there's a newer game in town, so to speak. Joe Miller is a high school music teacher in Anaheim, Calif. "I constantly hear students playing excerpts from video games on their instruments. It challenges them to learn new pieces and apply their ear to learn new music from scratch." Handfuls of kids sitting in band rooms around the world figuring out how to play their favorite game music are transforming into legitimate ensembles. In 2005, a viola player named Michelle Eng stood up at the end of orchestra rehearsal at the University of Maryland and asked if anyone would be interested in getting together to play video game music. "A half a dozen people raised their hands," says Robert Garner. Garner, who was recruited a few months later, is now the president of the Gamer Symphony Orchestra at the university. GSO now has around 115 members. "This is the largest we've been in the five years that we've been around," says Garner. On December 11th last year, the GSO overfilled the capacity of the performing arts venue on UM's campus. The Dekelboum Concert Hall seats 1,170 people. If that's not impressive enough, consider this: the students who perform with the GSO receive no class credit for doing so. They don't get paid, and they never charge for their concerts. Until recently, they didn't even have a place to rehearse. GSO has a place to rehearse now, but the players pay rent to the university to use it. They also must rent the concert hall for their performances. Additionally, they do most of the arranging of the music themselves. "It costs us about $12,000 to $15,000 a semester to do all the things that we do," Garner explains. "We get some funding from the Student Government Association. They have always been very good in the past at providing us what we need." The orchestra is trying to gain non-profit status in hopes of opening up other funding avenues. Ensembles like GSO are cropping up everywhere. 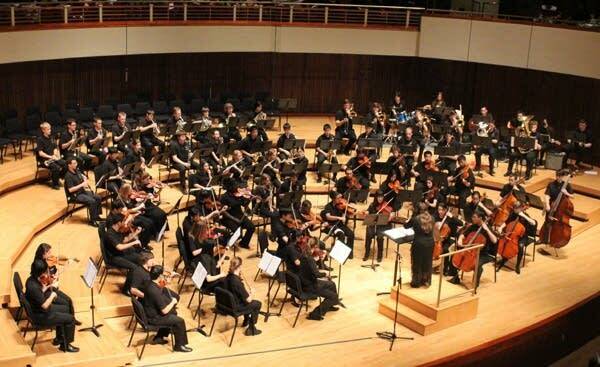 Students from Magruder High School and Damascus High School, both in Maryland, were inspired by GSO to create their own orchestras. Berklee School of Music in Boston has one called the Video Game Orchestra, or VGO. And, of course, off the beaten path of orchestral ensembles, there are dozens and dozens of rock bands that exclusively play covers of game music. The genre of gaming music is in its infancy, but could shows like Video Games Live be the pops concerts of the 21st century? I spoke with VGL's creator, Tommy Tallarico, last week. You can read the article here. Tallarico said he gets letters after each VGL show from parents whose kids were inspired by the show to learn an orchestral instrument. "That's where GSO fits in," says Rob Garner. GSO provides an organized outlet for musicians inspired by video games to perform video game music. "It's one reason we're so eager to seed other GSOs elsewhere." But if there is a divide between the acceptance of traditional classical music and film music as being considered "classical," that divide is far wider when video game music enters into the equation. It took five years of concerts by the GSO before a faculty member from the School of Music attended a show. That divide is understandable, to a classically-trained musician like me, I guess. Only two of GSO's members are music majors. But they more than hold their own in their musical abilities. You can make your own judgment by watching them perform in the videos posted. I also included the opening theme to The Elder Scrolls IV: Oblivion. It was the first time I heard music to a game andthought, "Something important is happening in the world of music these days..."